Designed for residential, commercial or industrial use with water or glycol mixture. 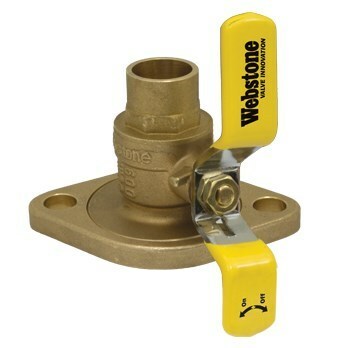 This approved Webstone valve is actuated by a blowout proof stem and features an adjustable packing gland. Flanges features a conical inlet to minimize turbulence. This rotating flange is secured by a sung-off snap-ring that provides greater control over positioning during installation. Solder joint temperature rating are per ASME B16.18 Annex A for 95-5 solder. Other solder materials have low pressure/temperature limits. Do not sliver braze or over heat valves when soldering. Bonus handle included with standard brass products only.